Happy Monday and welcome to the third guest post in a series of guest bloggers while my family recoups from Artoo's surgery! This week's challenge is brought to you by newly minted CZT Elisa Murphy, who i met while i was in Providence this spring! Hey there, Zentangle Nation!!! I’m Elisa Murphy, CZT 15. 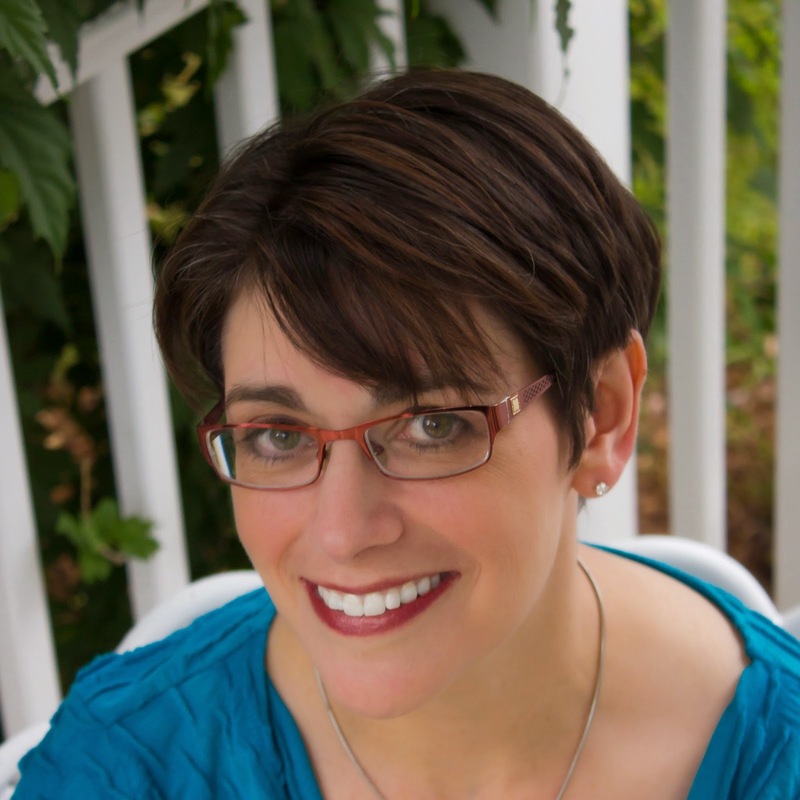 I am ridiculously excited and honored to be your guest blogger this week. I’m practically shaking about it!! Either that or I’ve had way too much coffee. One quick disclaimer before we get started: I’m a huge fan of sentence fragments. I apologize in advance to any grammar police out there. This week's challenge is inspired by the circumstances surrounding why Laura needs guest bloggers. Many of you know that Artoo just had eye surgery. Any parent would feel unsteady and plain scared about their kiddo needing surgery. It’s an even more profound experience of fear and powerlessness when your kiddo has unique circumstances and is prone to throwing medical “curve balls”. Learning how to cope with these events becomes it’s own unique art form. Like The Diva, I speak from experience. Here’s my idea. 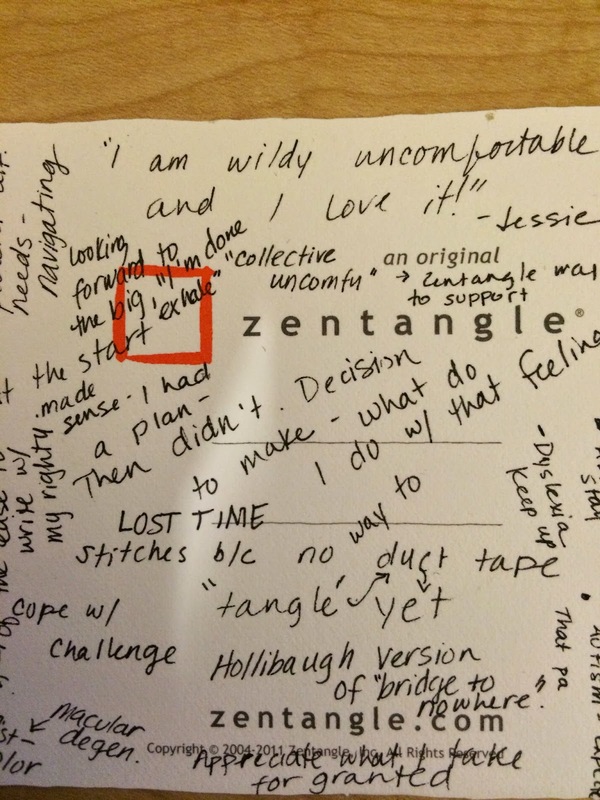 Let’s show some Zentangle solidarity and support for Laura and other fellow “Zentanglers” fighting the feelings that come with being forced to sit with that unsteadiness and powerlessness. My clinical term for this is, “Embracing the Yuck” (I’m so fancy). With all of this in mind, your challenge is to tangle with your non-dominant hand (including shading and blending). Cue the collective groan. For those uniquely lucky souls who are ambidextrous, please hold your pen, etc., like you’re singing into a microphone. Let’s return to the foundation of Zentangle and focus solely on that process, celebrating the imperfection of the product. Can you find the beauty in the discomfort? What happens when you tap into that shaky feeling as you navigate your tile? Did you find a way to adapt? While I was creating my example I decided to write my thoughts and feelings on the back. I welcome you, if it feels comfy, to do the same. My "journal entry" of what I was thinking and feeling while completing this challenge. Yes, this is how my mind works. This is why I can never find my keys. Time totally warped for me. When shading I became a little disoriented of where I should put my pencil next. I almost let my ego take over and use an eraser. Horrors, I know. But I didn’t do it!! Finally I reverted to my go-to coping mechanism, sarcastic humor: “Wow. Cool. I just created the Hollibaugh version of ‘bridge to nowhere’.” and the inevitable, “Ummm, what the heck was I thinking there?”. The closer I look at this, the more I see it's imperfections. Hello self doubt and insecurity. Honestly, the experience became unexpectedly powerful and thought provoking. But I have the power to change my perspective. I can chose to step back and see that in the big picture, I'm doing just fine. Lines soften and things seem to flow a little more smoothly. And THIS is why I love Zentangle. “Woah. 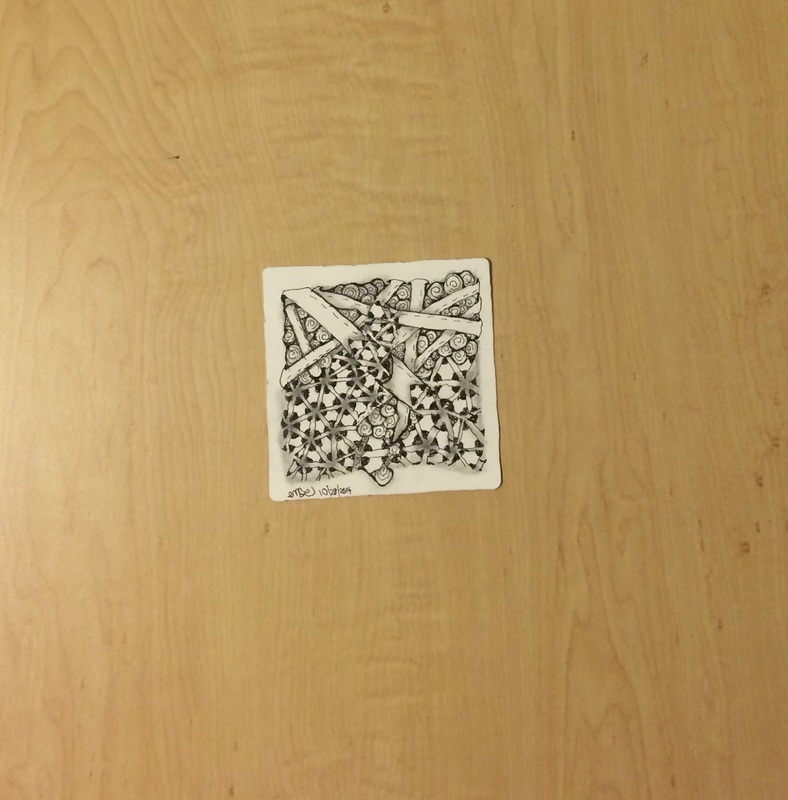 Mom, are you sure you want people to see THAT as your first Zentangle on that Lady’s blog?”. So.........Are you with me?? Can you throw perfection out the window with pride and let your Zentangle freaky-line flag fly?? Let’s do it for The Diva! Bio: I’m a mom, a wife, a survivor. I’m a classic “New Englandah” from Massachusetts. In other words, I’m a huge fan of sarcastic humor, waves crashing on a Cape Cod beach, and school cancelations during a good (wicked cool) snow storm. I found Zentangle® while trying to reconstruct my life after the devastating, sudden loss of my 13 year old daughter. 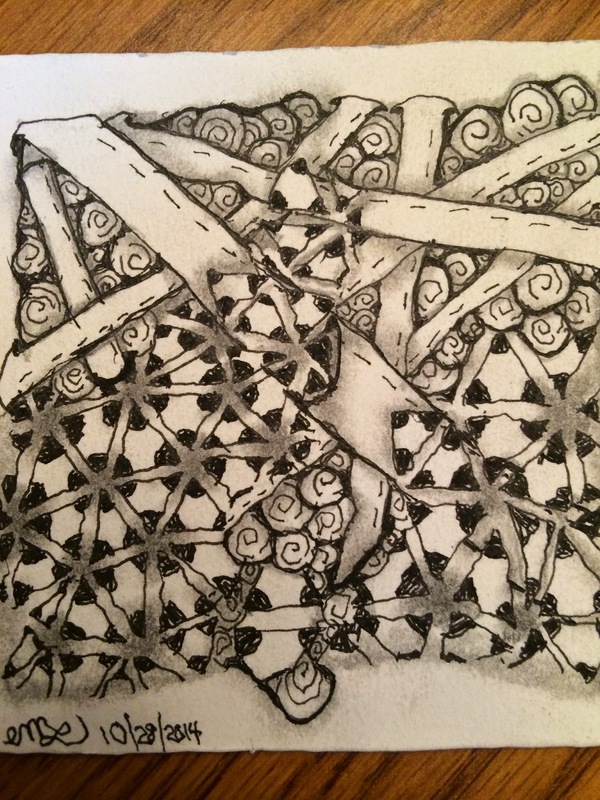 I completed my first Zentangle tile on October 11, 2013 (exactly one year and one day following her death) and rediscovered a creative, peaceful light within myself that I thought was lost forever. I felt a crazy pull to share the “Zentangle Effect” with folks around me so I registered, and this past June became a proud member of the remarkable CZT community and the CZT 15 family (hey, guys!!) . I love the non-dom...... can't wait to play! Thank you!!!!!!! I saw your tile and your thoughts. Beautiful. Just beautiful. I love you, Kelly. You inspire me and are part of the beautiful parts of our messed up "yuck". Thank you, Elisa for this (very hard to do) challenge and also for telling your story about the loss of your daughter. Anne, Thank you so much. That means a lot to me. Thanks for taking on the challenge. It's beautiful to share the experiences of doing this with eachother. Great challenge Elisa, and lots of fun. I love your challenge tile. It set the bar high. Kids are so honest. My son looked at mine and asked "Mum, are you alright?" Haha. Right? The look on my kiddo's face was hysterical. I actually did the tile over a few days, while I was waiting in the car for my kiddo to get out of school. I just used a clip board leaning against the steering wheel. Thanks for taking the challenge!! Can't express how grateful I am. Elisa, I think your tile is splendid! Thank you!! I laugh when I look at it. It's wonderful to just chill out, not judge so harshly and have fun! Dear Laura, I am not missing the slide shows! I find it a delight to visit everyone's websites, read their comments, and maybe see some other interesting things there. It does take longer, but it's a real pleasure. Thank you for all you do on your fabulous blog and prayers for you and your family go up every time I visit. PS This challenge is really fun--I play piano but my left hand is truly pathetic holding a pen. Wendy, I agree with you!!! And how cool is it to realize how piano and writing are totally different. I never would have thought about that. Elisa, Thank you sooooo much for this awesome challenge!! It bought such an insight and reflection on so many things while I was tangling!!! Elisa...and Laura: This was a wild experience...I play the piano, but the fine muscles I use for writing are so different than anything else I do with my hands. Great challenge! Wow! You're the second person who has shared this! So cool and interesting. Who would have thought?? You are so welcome, Sandra! I'm so glad you had fun and gave it a go!!! WOW! This was definitely a challenge! Since this is my first attempt at participating, I thought maybe I would wait another week to start in...but I did it :) Thanks for suggesting we 'step outside the box'. Great post! Wooohoooo Sheila!!!!!! I feel so honored that this was your first time participating! Honestly, it was mine too! I've been so intimidated by the tiles folks post, but I figured this week all of them would be imperfect and I can do that just fine!! Hello Elisa, love your amusing blogpost and I think your mad tangle is terrific, it's full of life! Thank you for your note. It means a lot. I guess the challenge was more about finding that silver lining in an uncomfortable situation. It was all about the metaphor of dealing with life when it's not Zen, and it's not Zen a lot of times. Be well and thank you again! You are most welcome, Diane. To me, it's not about what the tile looks like, but rather the process of where my mind goes as I create it. There's a saying in yoga, "It's not about reaching down to the floor. It's about what you learn on your way down". dear elisa, i really love this non-dominant-hand challenge. thank you so much.may be because it's easier to be in the moment, i was not thinking that much about the result.when i draw with my right hand it's a waaaay diffrent experience, especially what is going on with my thoughts.....and i like the ideas on your blog. Thanks, Tina. It's kind of cool that your creative, loving energy can reach through the computer and across oceans so that I may feel your warmth of heart and positivity. I'm so glad you enjoyed it . What a fabulous guest post. Thank you for your courage in sharing your story and your tile. This was so hard. I am always curious about what we learn when we do hard things. I learned that even when I was looking for one that would be "easy" each tangle pattern poses different left-handed challenges. It is hard to know where challenges will present themselves and I believe that practicing this kind of flexibility in our art can help us handle those curve balls that life throws our way. You got the point of this right on the button!! It's OK to be uncomfy. That doesn't mean liking it. Sometimes you just have to be with it and try like hell to take something positive from it. You totally got it and that means the world to me!! Thank you Elisa! I'm glad your daughter didn't talk you out of it! Lovely tile too! That was entertaining....I think. Actually it was great fun and while I tried to stick with easier tangles, I sure got tangled up! Giggle. Yeah, I hear ya! I'm really glad you kept your sense of humor about it and stuck with it!! Thank you!! interesting: the challenge#193 was challenged by 102 tanglers. #194 only 62 tanglers. it's interesting to me because we like to make beautyful things, not using time to only make an experiment where the result will not be what we want it to be. that's usually what i'm doing, it's just all about life, really. i compared this challenge with others, and there is an other obvious point:most of the other challenges don't have so many comments like the challenge #194.....from the out of comfort-zone. Hey there, Tina. I agree it's interesting. I've been thinking about it a lot and here's what I've come up with. I think some folks think "Embracing the Yuck" meant actually liking it. It doesn't. It means not fighting it but rather surviving it. I've survived so much tragedy, but if I just accept it or "embrace" it as a given, I can then take that energy and try to find some positive way to keep going. I recognize that folks experience things uniquely and that if one needs to tangle to escape the pain and find some comfort, this challenge wasn't going to do it. That's totally OK. I fully respect that. Wooohooooo!!!! I wish I could fly over there and register myself!! Thank you for the gentle push outside of my comfort zone! :) much love! Much love back atcha Zistah!